Over 25 years experience in the plumbing trade gives us the skills and knowledge to provide any plumbing jobs you have. We are available for all plumbing jobs including emergency call outs for leaks and burst pipes. We offer our customers an unrivalled plumbing services throughout Glasgow and the surrounding areas. All work carried out to a guaranteed high level. We offer many plumbing services. For a full list of our skills on offer see below. Bathroom upgrades available. 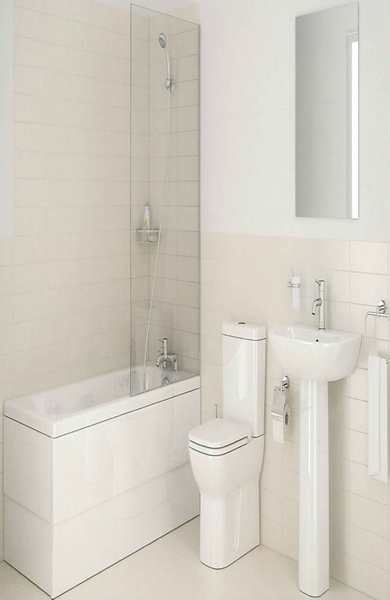 We can supply and fit from a range of bathroom suites available. Handyman Services Glasgow are delighted to offer a five piece Armitage Shanks Bathroom Suite for only £499.99 which includes removal of your old suite. See our Plumbing Slideshow for examples of suites available. Are you paying through the nose for bottled water not to mention the environmental effects from the plastic? Water filters can put the end to carrying heavy bottles from the shops! Quick to install a water filter will pay for itself in no time.